I’ve been hacking away at a less fun and visually unimpressive part of the game idea for Space Warfare: Infinite — the Editor. The mission editor will hopefully be one thing to help set the game apart. As a gamer, the one thing I’ve always loved is being able to create my own game maps and play them. I made my own text adventures, had 3D Studio, I made stuff with the DEU – Doom Editing Utility, tried my hand making Unreal Tournament levels, made my own Starcraft maps. My hope is that this will be a feature that will attract an audience. I call it a Mission Editor, but the scope is going to be more than that. When its complete the player or me (I plan on using this to build the entire campaign mode of the game….) will be able to create simple battles, missions with objectives that range from patrol and fight pirates to a scripted battle between two giant fleets complete with dialogue and cutscenes. Place ships, stations and other objects on a 3D map. Select a setting including naming the sector, adding planets, nebula/other background art, asteroids. Setting space dust/nebular clouds. Place nav points and waypoints. Trigger and Event Scripting – Trigger events like spawning new ships, winning a mission when ships are destroyed / navpoints reached, displaying a comm message etc. Ship yard editor – Customize, edit existing ships or other objects. Change default load-outs etc. Build new ships from component parts and add them to the game for user-created campaigns. (Customizing ship data will be available in xml no matter what… ). Something like this will be useful for my own dev so I might make something like this part of the initial tool set. At least to set up different specialized ships so I don’t have to dig through XML files. Unity is tough to mod for. I am looking at way to import user generated models for ships etc, but at the moment the moment it’s looking complicated. I have some ideas, but I can’t focus on it just now. On the flip side, modeling component based ships is already happening so adding a build-your-own based on my already modeled ship pieces might be simpler. I might even add some Star Trek / Star Wars -inspired hull styles etc, so that players can design their own styles. System Map Editor – Like the campaign editor but missions would stand in as maps, they would be connected by triggers like reaching a nav point in a warp to bring you to the connected map. Posted in Dev Log, Space Warfare: Infinite. 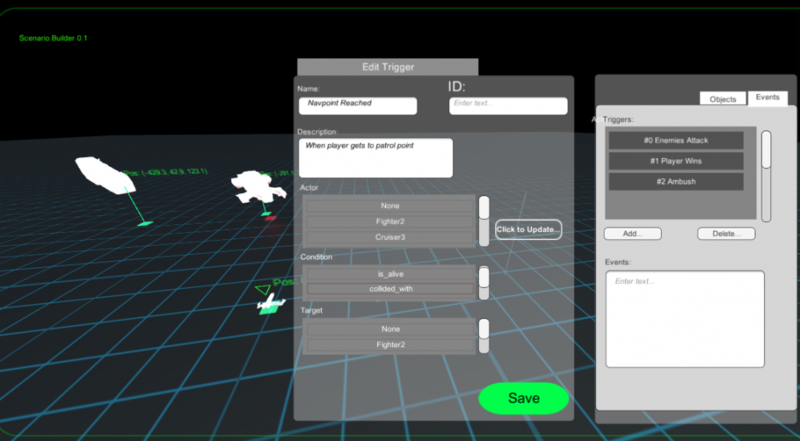 Tagged 3D modeling, editor, level editor, make your own, mission editor, modding, scripting, space warfare infinite.